A simple choice... a lifetime of results. Here at Vital Nutrition Plus, our goal is to provide your family the tools that help make family meal times a success. Engineered moisture seal locks in flavor, nutrients, and aroma. Helps prevent dry, tasteless food. Improves nutritional value of your meals. Cooks faster using less heat. 3-in-1: Whistle, Lock, Vent. The whistle indicates that your food has reached the proper cooking temperature.The vent setting allows you to release vapor without whistling. Choose the lock setting to lock in moisture, nutrients, and flavor. 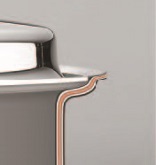 Ergonomic handles created with your comfort in mind. Extremely durable, withstanding up to 350 degrees, the Cool Grip design eliminates the need for pot holders. The slide-out ring allows for easy hanging storage. Easy-store covers are perfect for any kitchen and every lifestyle. Cookware easily stacks in the cabinet in an organized way. Plus, the self-nesting design uses a minimal amount of space. You’ll never search for a cover again! Our state-of-the-art cooking system ensures highly nutritious foods that are flavorful and tender. 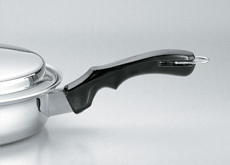 In addition to maximizing time, saving money, and providing peace of mind, this high-quality cookware has a lifetime warranty. 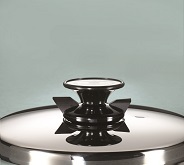 Vital Nutrition Plus Cookware is engineered and constructed of the finest quality materials in the industry. We combine 19-9 Surgical Stainless 7-Ply full body construction, an engineered moisture seal, a tri-vent whistle, and some of the heaviest cover steel available to create a complete cooking system. This is not just another set of pots and pans. Vital Nutrition Plus cookware provides excellent heat conduction, a non-reactive surface that will not leach metals or chemicals into your food, and a minimum-moisture method of preparation.